Many people have a hard time adjusting emotionally to wintertime. The nights are longer, sunshine can be limited, and the weather hinders outside activity. I’ve watched friends and family struggle with the lack of joy that can come until it becomes debilitating. These things can add up to a sad heart, leading to less productive and enjoyable work. If you’re struggling with the winter blues, eat healthy, exercise, find a friend, and put your hope in God. Remember springtime is coming! Are you maximizing the use of your God given talents at work? Join us December 6th for our “Maximizing Your Calling” webinar to experience the joy of unleashing your potential. “If you are an executive that thrives on business but are thirsting for more, this book may be your story as well. 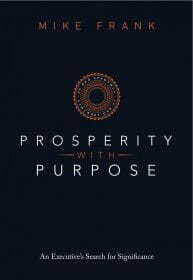 I can’t give you the formula for success, but I can show you how to live a life of relentless purpose…which may or may not include profound wealth”. Click here to learn more.